Ciao Italia, finally we say hello. With massive lines out the door on any given day of the week, Ciao Italia is a must for any fan of Italian food, generous servings and good prices. Knowing there would be lines we went on a Tuesday night at 5.45pm, convinced that we wouldn’t have to wait. We were wrong, already there was a 20 minute wait and the restaurant was bustling with activity. When we were seated inside we were met with red checked tablecloths, smiling faces of the serving staff and the delicious smell of good cooking. The restaurant was noisy and packed but it felt more like a meal at home with background noise, and was to be expected for such a busy place. 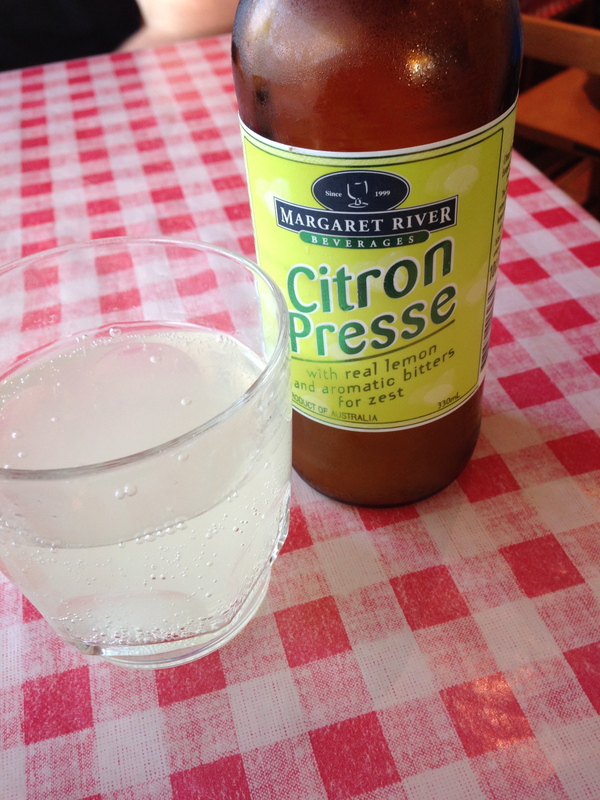 We were served fairly promptly, and had a refreshing citron pressed from Margaret river, beautifully tart. 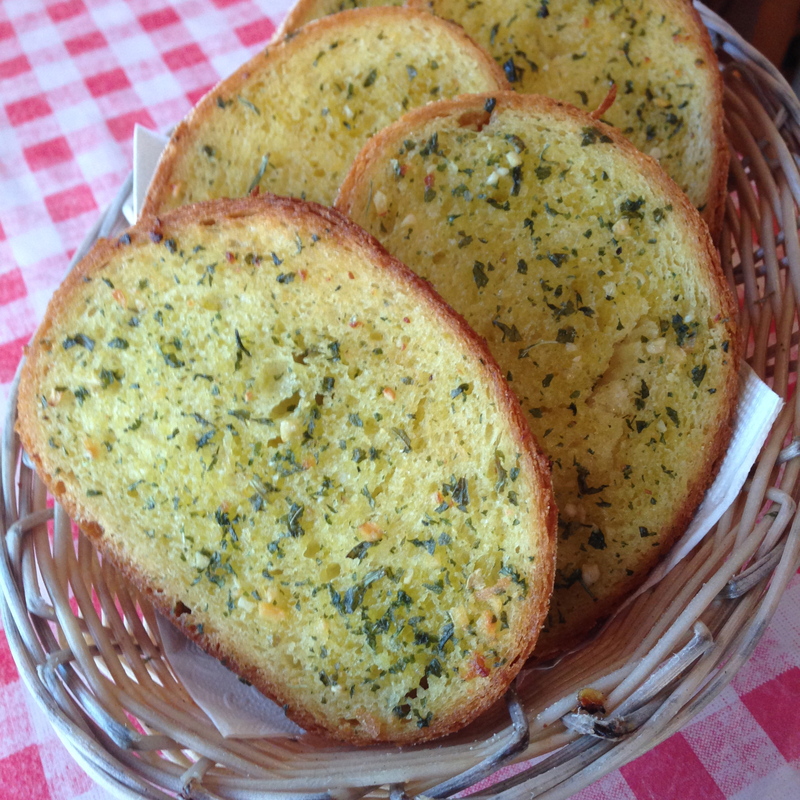 We started with garlic bread, the smell was intoxicating, and you could smell the garlic before it arrived at your table. When it arrived it was perfect, crunchy, buttery, garlic-y goodness! They did not disappoint! We were a little optimistic in ordering a pizza and a pasta to share, but we figured the portions really couldn’t be as massive as we had heard. We were very wrong on that too, the servings were so huge we got an extra meal out of it the next night. Both dishes were their specials, a herb, chicken, tomato, cheese pasta, as well as a pepperoni pizza, with an absolute mountain of pepperoni, a herbed base and a centre of fresh tomato with a little onion and basil. 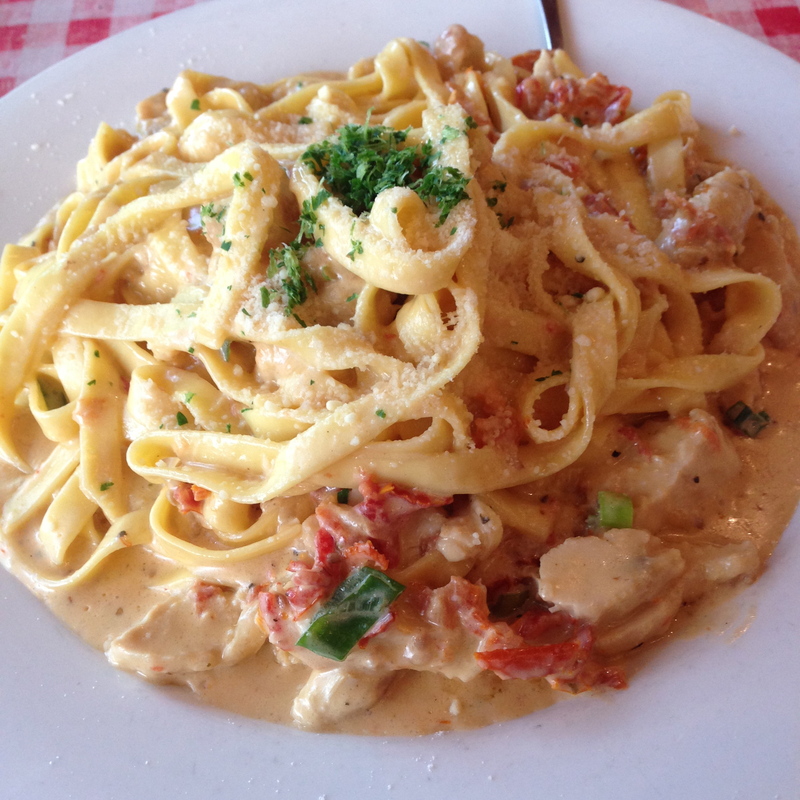 The pasta was creamy, the chicken succulent, not dry as it often can be and the pasta was al-dente. While it was rich the flavours were well balanced, and there was a good mix of pasta, sauce and chicken.The pizza was incredibly visually appealing, the pepperoni still had a little sizzle and contrasted nicely with the bright tomato in the centre. The pizza was very tasty, it had a bit of spice to it, but the tomato was cooling. The only downside was that the based became soggy in the centre quickly due to the tomato giving off water, and frankly you can’t really put a slice of pizza with that much pepperoni in your gob without getting it everywhere, but we didn’t mind too much. You’d think we would be full by now yeah? Somewhat shamefully I have to admit that the sight of another table receiving dessert, and the fact that our eyes are bigger then our stomachs lead us to order a delectable strawberry tart. It was just as generous a serving as with everything else, and arrived towering over a plate filled with cream and strawberry sauce. 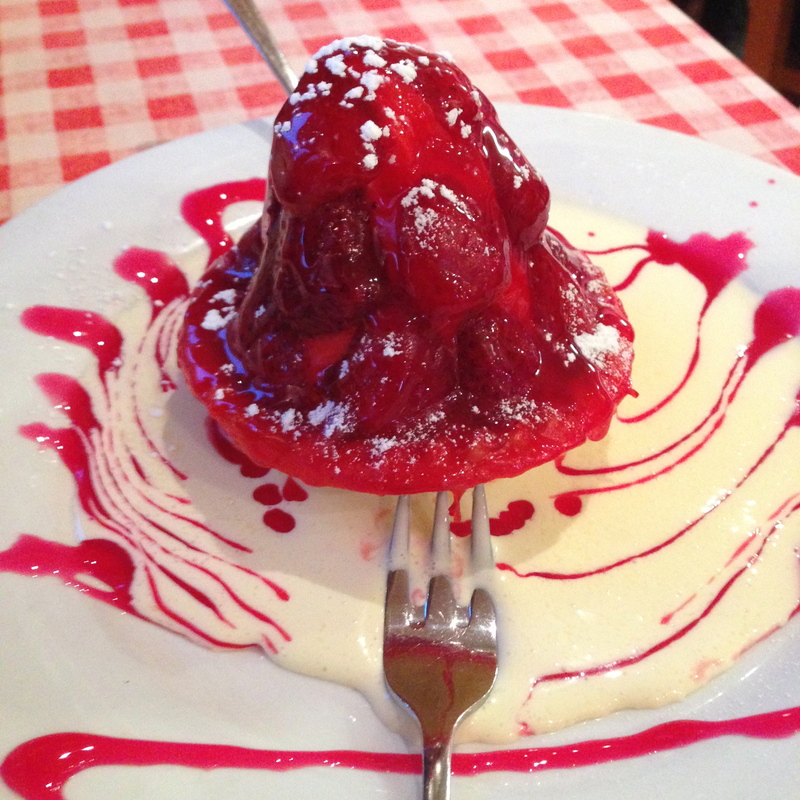 It was filled with a vanilla custard and surrounded by more strawberries. Rich, sweet, creamy, delicious, filling.An amazing end to our meal! 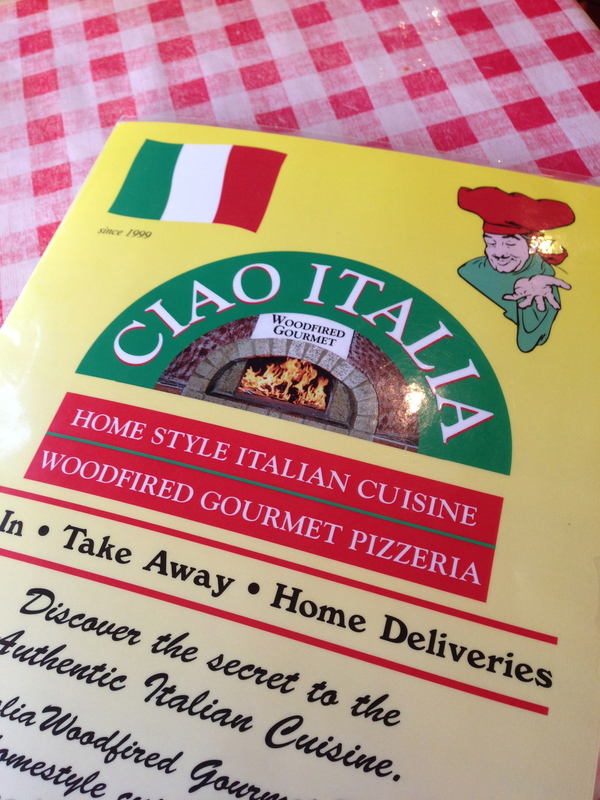 Have you been to Ciao Italia? What did you think? Let me know in the comments!